The Changing Attitude Blog: Do you believe that God has called you to this ministry? Do you believe that God has called you to this ministry? This question, or something like it, is asked of candidates for ordination, frequently, and at various stages. It is the ultimate question: the only one that truly matters, though the call, or vocation, must be tested by the wider church, which usually involves a long and rigorous discernment process. Why then should three Church of England Bishops be so concerned to screen out candidates who are lesbian, gay, bisexual or transgender (LBGT)? And not just those who feel that God is calling them to ordained ministry but lay ministry as well; in fact, anyone who aspires to a leadership or public role in a faith community? I am referring, of course, to the Bishops of Winchester, Exeter and Chester, who are said to be campaigning in the House of Lords to defeat the Equality Bill, lest faith communities find themselves accused of discrimination, as happened in the case of John Reaney, a diocesan youth officer, in the diocese of Hereford. A rigorous discernment process, which the Church of England has in place, combined with professional interviewing and human resources processes, should be more than sufficient to ensure that those who are selected for training, or particular posts, lay or ordained, are indeed the people that God has duly called. It is, therefore, an absolute disgrace to seek to prevent a person of faith from entering the selection process, or to disqualify them from a post, simply for being LGBT. It is, nothing less than an assault on their God-given humanity and a dreadful denial of the integrity of their faith journey. Much has been heard recently from the bishops in the Lords about the need to balance individual rights with the rights of the faith communities, but we hear very little about the incredible gymnastics that goes on in the hearts and souls of faithful LGBT people who have to manage the call of God to service and membership of the body of Christ with such apparent rejection from their senior pastors. For some the tension is too much, and they turn to other, more welcoming churches, like the Metropolitan Community Church, while others turn away completely and begin to hate the Church with a passionate hatred, and who can blame them? But the call of God continues – that, at least, cannot be frustrated by amendments to Parliamentary Bills. And God calls people – often indiscriminately, or so it might seem according to our prim and proper notions of who should and should not be called. God doesn’t seem to notice the labels that we attach to ourselves or to other people: he calls men and women, and - to quote playwright Jo Clifford – those who are ‘something in between’ (God’s New Frock) as well. And there’s another thing that puzzles me about the current episcopal agitation. I’ll let Colin and others consider their amendments from the sexual orientation point of view, but twice now, within the last few weeks, in the House of Lords, bishops have pointed out that the Church of England has not yet made up its mind about ‘transgendering’ (by which, presumably, is meant transitioning). 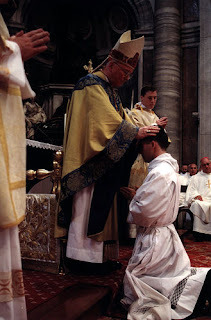 Indeed one of the three bishops I’ve mentioned stated that he would be willing to ordain or to officiate at the marriage of someone who had transitioned from one gender to another, though he admitted that he was aware of colleagues who would not be prepared to do this. In that case, if no agreement has been reached, why is it thought necessary to include transgender people in this list of exemptions at all? Evidently it has not yet become a matter of dogma on which all believers concur. It is very hard for me to have respect for some of the Bishops of The Church of England...The Archbishop of Canterbury lost my TRUST a long time ago...he simply errors on the side of cowardly ¨omission¨ and punishes those who don´t live in his self-twisted World of right vs. wrong PRETEND. The man is sad beyond my understanding of all that is good and holy and attempts to destroy much that is wholesome and good about The Anglican Communion. The three bishops concerned have a track record on these matters which speaks for itself. I don't think they are motivated by love, compassion or tenderness. So many people are willing to discuss LGBT people but not talk to LGBT people, so many people seem to know the right answer based on a lot of assumptions and ignorance. Then, as you say, they will admit their ignorance. Someone once said to me,"there's gay, bi,transgendered, transsexual" - are you saying all these identities and conditions should be equally respected?" I asked him if he thought the people involved deserved to be equally respected? He was speechless! I'm ten years mtf post-op, and feeling the call to ministry in the Church in Wales. The whole transitioning thing is ancient history for me, but I still am daunted by events like this vote, which seem to fly in the face of all the personal acceptance and encouragement I receive from the clergy who know me. I wait with trepidation to see what kind of reaction I might receive from the selection panels. All I know is that God made me, knows me and loves me; and I put my trust in him. I am very grateful to CA for making the case on behalf of people like myself, long before I even knew I needed their support. Hi Anonymous, it is good to hear from you and I hope and pray that all will go well for you with the selection process. The case of the Revd Sarah Jones in the Hereford diocese should give you some hope: from that one example it would seem that the Church of England - I know you are Church in Wales - has found it easier to ordain someone who has transitioned than it has to cope with the transition of those it has previously ordained, and one can understand that, to a point. This is a subject that I hope to post about at some stage. Hi Tina, thanks so much for your encouragement. I wonder, if you know Sarah, do you think she would be willing to share her experience of the selection process with me? I'm sorry Anonymous, I've only just seen your question today, when I was copying a link. Sarah has spoken at Greenbelt about her journey so my guess is that she would be prepared to share with people. How will you get in touch? You could write or email her. The contact details will be in Crockfords Clerical Directory.